Sage ACT! 2011: Your “now-I-can-beat-the-pants-off-my-competition” business tool. With a focus on productivity and automation, the latest ACT! upgrade is a winner. Building on the ACT! 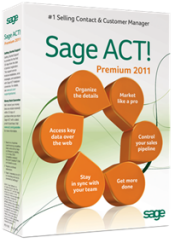 2010 redesign that added social media and e-mail marketing capabilities, ACT! 2011 Premium earned PC Magazine’s Editors Choice award for contact management. Evaluate basic company and competitor info from within ACT! contacts (free). Schedules a single or multiple activities based on certain criteria. Track the interest level of emails you send, like newsletters, calls to action and sales opportunity follow-ups by identifying which customers are interacting with your emails and learning what is of most interest to them. 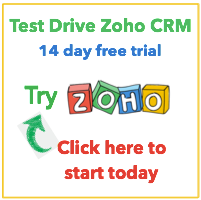 Request updates or missing contact details from your customers by emailing a link to an online survey. Once the survey is completed, those details are automatically populated back into Sage ACT!. Integrated drip marketing and e-mail marketing in Sage e-Marketing help you communicate your message effectively. ACT! and Microsoft® Outlook® sync gets everyone on the same page. With new ACT!/Microsoft® Outlook® synchronization, you can manage emails, basic contact details, and meetings throughout your workgroup. Integrate Sage ACT! and Outlook contacts, plus keep your calendars in sync. Everything will be kept updated in both places. Now everyone on your team is on the same page, even if they don’t use ACT! Works with Web or desktop installations. These great new features add up to a simple equation: Use ACT! = Get more business. Filter by History Type – Now you can filter the display on the History tab by ANY history type to exclude types like Deleted Contacts or Field Changes. You can also narrow the display to only display Meetings or one of your Custom Activity types. Direct Import from MS Excel – No more need to save as a text file type (*.csv or *.txt). You can import straight from an Excel file. Security for Email History – New security feature prevents email history from being added to internal ACT! User records (no personal emails to an internal employee are attached to the ACT! database). On the verge can help you get started. Learn more about our services and exceptional results. Contact us here or call us at 781-606-0433.